A woman's hair is often referred to as her "crowning glory". On no day will this be more true than your wedding day. If you have medium length hair, you will find that there are many hairstyles available to you. It is just a matter of picking the right one. There are several things to consider when deciding on your wedding hairstyle. The first is the formality of your wedding. Just as a stiff updo might look out of place at a backyard barbeque, wearing your hair loose might seem underdone at a cathedral ceremony. It is important to match your hairstyle to both the formality of your bridal gown and your wedding location. Another thing to keep in mind will be weather conditions. If your hair wilts in the heat, forgo the big loose curls that will fall flat before you even finish exchanging your vows. You may also find that on a hot day, it will be cooler to have your hair up off of your neck. Getting married on a windswept beach? Then pull the front of your hair back to keep it from blowing in your face. The length of your hair will be another determining factor. Brides with medium length hair are lucky, because they can choose almost any style. It is long enough to pull up, yet short enough that it won't be unruly or messy looking when worn down. One of the most popular wedding hairstyles for brides with medium length hair is the half up look. 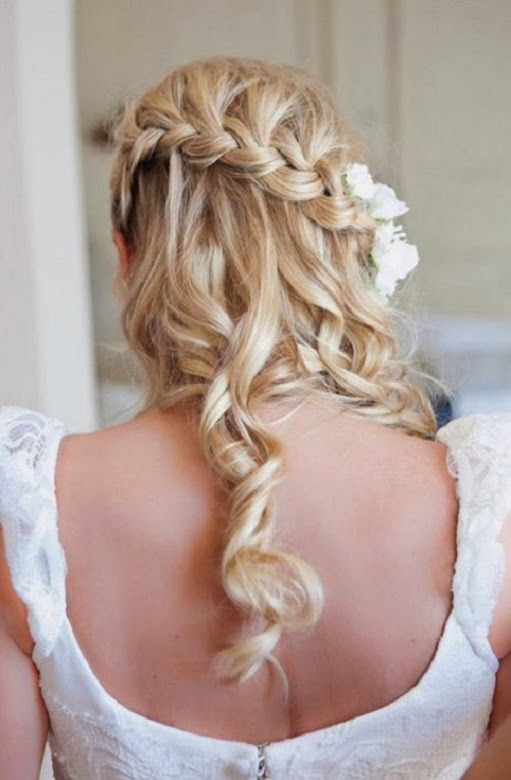 In this hairdo, the stylist will pull the front of the bride's hair back, and leave the rest flowing down. This look tends to work well for any formality of wedding. Having the hair shaped into a definitive style makes it polished enough for a more formal wedding, but having some of the hair left soft and flowing makes the half up style feel feminine and un-stuffy, as well. It is the best of both worlds. One advantage of the half up style over leaving all of your hair down is that it makes it easy to anchor the bridal jewelry that you have chosen for your hair. You can wear a twinkling crystal tiara or headband for the most dressy look. If you prefer vintage styles, then a rhinestone comb would be perfect tucked into the side of your hair. You can also wear a comb on the top of your head with feminine details such as porcelain flowers for a romantic effect. Just be certain that the bridal jewelry you choose for your hair coordinates with the rest of your wedding jewelry. 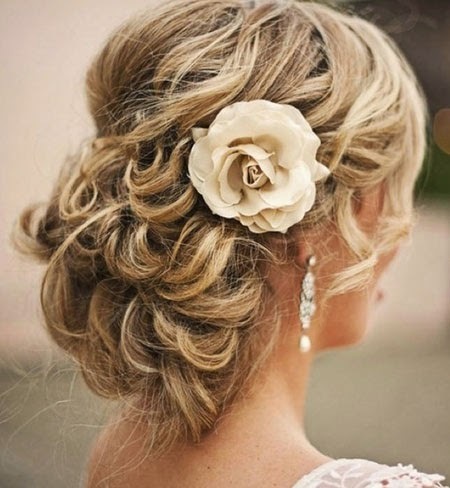 Brides with medium length hair can certainly wear almost any type of updo for their wedding. An updo is often considered to be very formal, but it doesn't have to be. It can be simple and chic, like a classic chignon. It can also be more relaxed, such as a messy bun with little loose tendrils. There are a couple of good reasons to think about wearing your hair all up. One is that your hair will be under control and out of your face for the entire wedding. The other one is that wearing your hair up allows you to showcase a beautiful bridal necklace. Whichever way you choose to wear your hair for your wedding, be certain to have a trial run. This will give you the chance to see how you like the style with your wedding gown. When your hair looks perfect, you know that you will feel beautiful on your wedding day.